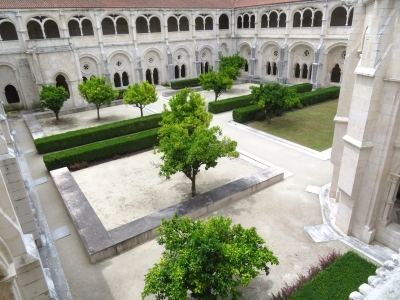 The Monastery of Alcobaça is a unique monastic establishment and a masterpiece of Gothic Cistercian art. It was founded by the first Portuguese King, Afonso Henriques, in 1153, and maintained a close association with the Kings of Portugal throughout its history. The building of the monastery began in 1178, some 25 years after the arrival of the Cistercian monks in the Alcobaça region. Initially, the monks lived in wooden houses, and only moved to the new stone monastery buildings in 1223. The church was completed in 1252. The finished church and monastery were the first truly Gothic buildings in Portugal, and the church was the largest in Portugal. The church includes Royal Tombs and the Royal Pantheon. The kitchen of the monastery was built and covered with tiles in the mid-18th century. The central chimney is enormous, supported by eight iron columns. Water and fresh fish were diverted from the river Alcoa to the kitchen basin through a specially-built canal. One of my Portuguese favourites, this site is. Two hours by public bus from Lisbon, through continuous rain, took me there. But the sun started to shine when I arrived in the town of Alcobaça. The Monastery is in the heart of it, so locals are confronted by it every day when they go to the post office or shopping. While the outside looks massive, the inside is very pretty. I especially lingered in the huge kitchen. This is completely covered with white and blue tiles and has a strangely scaped chimney (see picture above). While there are plenty of monasteries on the world heritage list, its so hard to place sites like this on the OUV spectrum. 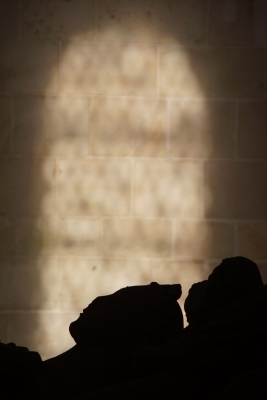 What makes a beautiful and historic monastery more valuable than another? I am certainly wary when considering new nominations that are already over-represented. 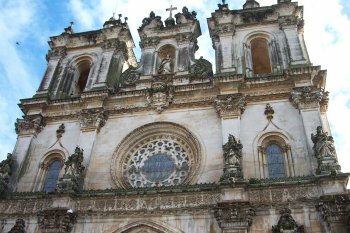 Yet, Alcobaça was inscribed in 1989 and like many world heritage inscriptions during that first decade its really a worthwhile site to visit. I visited Portugal in May 2018 and Alcobaça was the first of three WHS of the monastery hotspot in the Centro region. I stayed overnight in Alcobaça and was the first and only one at the entrance to the monastery on a Sunday morning at 9 am. At the ticket counter I was recommended to visit the church first, because there would be a mass at 11 am. For about 15 minutes I had this huge nave all to myself, a wonderful atmosphere. The church emanates a simple elegance, there is only little decoration, all in line with the spiritual view of the Cistercian order. The interior is impressive by its size, I was surprised to read that it is the largest Portuguese church. Most striking are the shrines of Inês de Castro (photo) and King Pedro I in the transept. Their tragic love story is very popular in Portugal and inspired numerous works of literature and music. The reliefs on the tomb of Pedro show scenes from their lives. The tomb of Ines is carried by sculptures that are supposed to depict her three murderers. 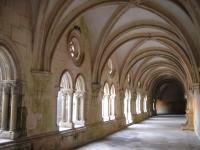 Only a part of the monastery is open to visitors, mainly the rooms around the oldest cloister, the Claustro de Silencio. 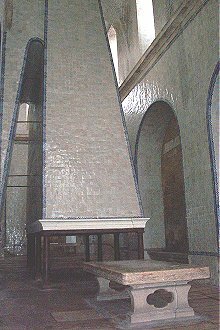 Coming from the church, you first enter the Room of the Kings decorated with white-and-blue tiles. Other highlights are the refectory, the chapter house and the monastery kitchen with its huge chimney and a large water basin, part of an elaborated system for water supply: water was diverted from the river Alcoa and filled the basin via a pipeline under the kitchen floor, a second pipeline transported drinking water from a natural spring into the basins along the wall. 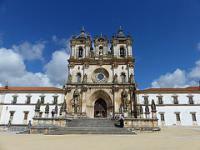 Alcobaça is often regarded as the least impressive and least rewarding site of the three WHS monasteries. I do not agree with that, I like this architecture: the clear lines, the rather plain pillars and arches, the sparing use of decorative elements. That only intensifies the impression that all the rooms are a bit oversized for their purpose, in particular the height. Certainly a intended effect. The architecture is an expression of the ideals of the Cistercians: modesty and humility, life was dedicated to the service to God. Thus, Alcobaça should rather be compared with Maulbronn in Germany or Poblet in Spain. After visiting the monastery, I went to the church again, the service was still going on, but the church was less than half full. One last view along the huge nave, then I continued with my monastery triple pack and went to Batalha. I visited Alcobaca as part of an organized daytrip from Lisbon (together with Batalha, Óbidos, Nazaré and Fatima), so we only had a limited amount of time available there. Basically, we just got a look around the huge main church, but not at the rest of the monastery complex. The church is the largest in Portugal and features the Royal Pantheon where 3 kings of Portugal are buried. The most famous sarcopahagi, and the main reason so many tourists visit the church, are those of King Pedro I. and his mistress Ines who had an ill-fated love story in the 14th century. I visited this WHS in August 2014. I spent half a day here after visiting Batalha and on my way to Lisbon. Again the combined ticket I had bought in Tomar turned out to be quite handy although there were less people here than there were in Tomar or Batalha. The highlight of my visit was the recently whitewashed courtyard although on the whole this is the monastery that impressed me the least as a WHS. Perhaps it was just fatigue but apart from being a huge structure with a lovely courtyard I cannot say that I felt it justifies its inscription as it didn't deliver any OUV. Nonetheless it was a pleasant stop on the way to Lisbon. From the lonely train station, I took a taxi to revisit the famous Monastery of Santa Maria of Alcobaça which located almost in the middle of the small town of the same name, Alcobaça. After got information on connecting bus to Batalha from the very friendly tourist information and nice hot chocolate from the lovely café on the monastery square, I was ready to explore the huge monastery again. The first thing I admired was the monastery’s façade and entrance; its perfect proportion with the rest of the complex was really well designed and its lovely sculptures were really supporting the overall ensemble. For interior, at first, I was quite disappointed to the really plainness of the church, but the magnificent tombs of Petro I and his wife, Ines de Castro and their tragic love story colorfully filled the church with romantic theme. Other highlights were the cloister, the refectory and the monastery kitchen, the cloister was really large with many lovely decorations especially from the second floor, and the fountain hall was one of the best sights of the monastery. The refectory, in my opinion, maybe the most elaborated room of the monastery with many beautiful window channels, and lovely pulpit. The monastery kitchen was quite unique with the really big chimney liked industrial factory. For other parts of the monastery were quite simple with really plain design with some glazed tiles decorated, a very typical Portuguese interior. The tour route inside the monastery was quite well organized and after many rooms, I was back to the church again. Actually only a quarter of the monastery was opened to the public which made me wondered for the rest of the complex that reportedly destroyed and looted by French troop and anti-clerical riot and now are developing to be exhibition gallery. 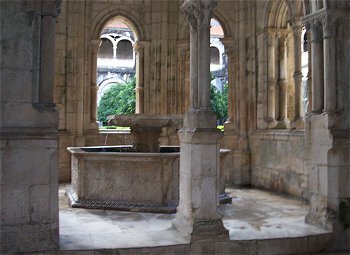 It was really tempted to compare Alcobaça Monastery with other three WHS listed monastic buildings of Portugal, Batalha, Tomar and Belem. Each had many similarities especially in term of architecture, but each site had unique characteristic enough to shrine by itself; for example, Batalha was so fanciful and load of elaborated details, Tomar was liked a fortress or labyrinth more than convent, and Belem was so stately and well maintained with superb quality. For my opinion, Alcobaça was in the middle of all, the monastery was very large with some acceptable elaborated details with simple but elegant elements of state monument, but one thing really outstanding was the monastery complex surprisingly made a feeling of home with spacious, warm and bright rooms more than other places testifying the perfect living place for generations of monk who called this place as a home. 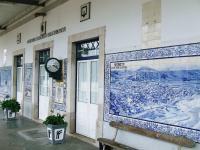 The blue and white tile panels at Alcobaca station are also interesting, depicting scenes from the Holy Land. The station is at Valado, some distance from the monastery. Connecting buses are available during the week, but at the weekend there are only taxis. its a magnificent and beutifull place. It has the large church in portugal and it reprensents a great testimony of the portugal's independence. 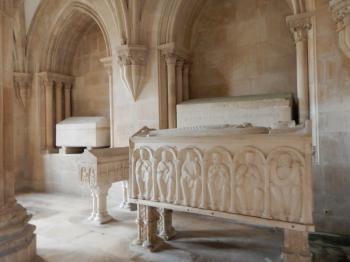 In fact 3 kings of Portugal, are buried there. I love the grandeur and simplicity of this place. Reminded me of the design addage "Less is More". I have visited this site on a family trip some years ago. It is an overwelming site like many in Portugal large or small. 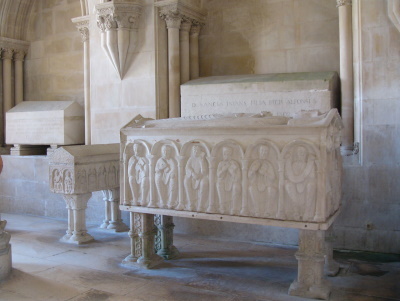 Dynastic Burial Places: Kings Afonso II, Afonso III, and their Queens Urraca of Castile and Beatrice of Castile are buried here, as well as King Pedro I and his mistress, In?s de Castro.